This passport was issued in New York to the vessel Mary, which was under the command of Charles F. Chace and had a carrying capacity of 287 tons, also known as “burden.” There is no information on destination or cargo, but the Mary carried no guns and had a crew of 12 men. It is possible that Captain Chace gave up the sea soon after this voyage because there is a Charles F. Chase listed in New York as a broker at 26 Wall Street in 1837. 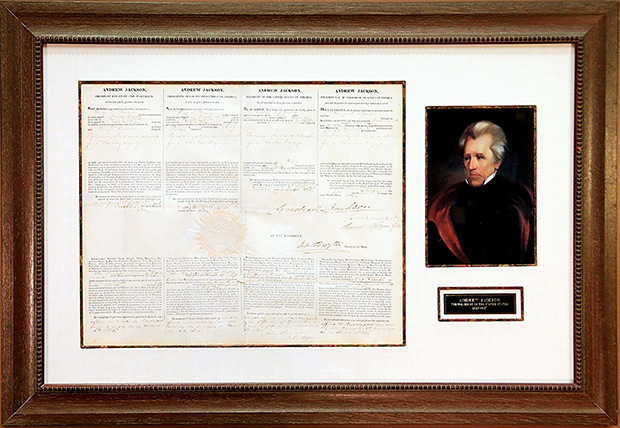 This Mediterranean passport is signed by President Andrew Jackson who served two terms from March 4, 1829 until March 4, 1837. Jackson was something of a renegade as President. As a heroic general in the War of 1812, he was used to giving orders but also championed the common man. In office he seldom deferred to congress and used his veto and his political power to assert his authority. He argued against the Electoral College and entrenched office holders. Out of the controversy he created the old Republican split into the Democratic Republicans (Democrats) and the national Republicans (Whigs). His popularity grew so that in the election for his second term he received 56 percent of the popular vote and nearly five times the electoral votes as his opponent. His Secretary of State, John Forsyth also signed this sea letter. Forsyth served in both the U.S. House of Representatives and the U.S Senate, was governor of Georgia and had been Minister to Spain before being appointed Secretary of State. With Jackson he resolved a long-standing dispute with France over reparations due to the U.S. for the damage inflicted on U.S. commerce during the Napoleonic Wars. Ultimately France paid $5 million to settle the claim and the U.S. lowered the import duty on French wines! The other signer of the document is Collector of Customs for the Port of New York, Samuel Swartwout who succeeded Jonathan Thompson. Swartwout is notorious for his “defalcations” (embezzlement) amounting to $1,225,705.69, a vast amount in 1837. Swartwout fled to England with his ill-gotten fortune. This passport is printed on vellum and as is typical of Mediterranean passports, the top is scalloped where the top portion was cut off and sent to United States consuls in the Mediterranean for later matching with the passport held by the ship. It bears the Great Seal of the Untied States on the lower left.